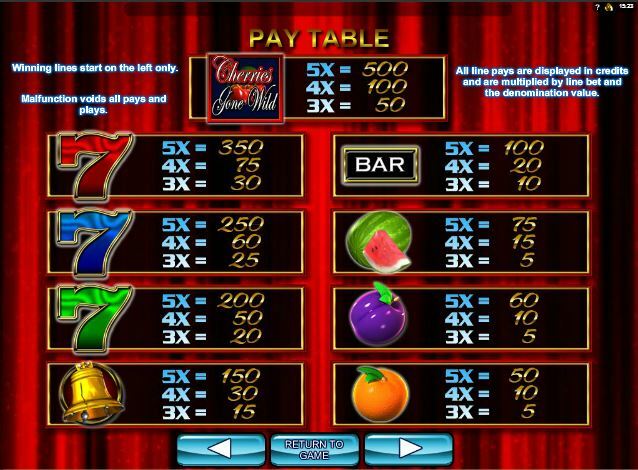 A slot machine which is offered by Microgaming, Cherries Gone Wild has a very visible classic influence, which is present mostly in the symbols which are used. The actual layout and implementation of the game is a modern one, using the reels and features that you would expect to see. The stars are the cherries though, along with the other fruit and seven icons that 3 reel games have been offering for a long time. 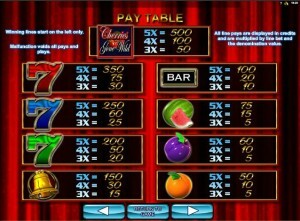 A 5 reel slot machine, Cherries Gone Wild has 30 paylines to offer. Free spins, scatter symbols and wilds are its only features. The prizes will go up to $2,500. 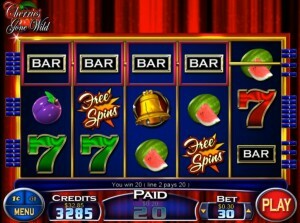 Wild and scatter symbols are the stars in this game, where you can trigger free spins as you play. You don’t get a huge number of features, but the ones you have are pretty good. The Wild Cherries are part of the symbol with substitution abilities, like you would expect in a slot where this is announced by the title. Wild symbols can replace regular symbols only, so they will not work when the scatters are concerned. They also don’t give you prizes by forming their own combinations, so they’re only useful as assistants for other icons. Multiple wild symbols can show up on the same reel, if you’re lucky. As for the scatter symbol, it comes with the Free Spins Logo on it and it’s going to appear on three out of five reels (2, 3 and 4). Get it at the same time, on all three, and your reward will be the round of 10 free spins. 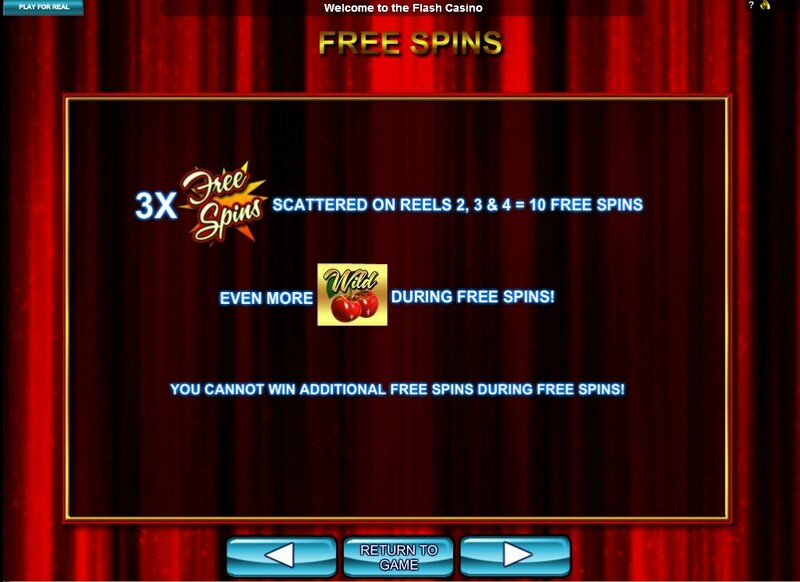 Additional wilds are part of the reels during the free spins. The downside is that you can’t retrigger the free spins. 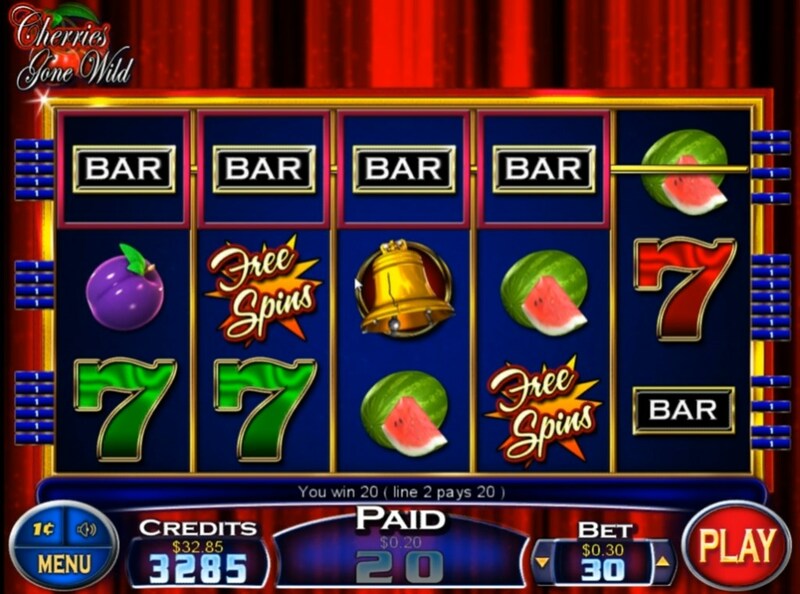 The slot has 30 lines, and each one can get up to 20 coins when the bets are made. The coin has a value that you decide, but within the $0.01 to $0.25 range. A line bet can go up to $5, while the total bet will use up to 600 coins, or $150 cash. The biggest rewards give you 500x the line bet, or about 10,000 coins. The actual value is only $2,500 at best. Like plenty of other slots before it, Cherries Gone Wild chooses a classic collection of symbols (fruit, different sevens, bells and bars), but it offers them in a modern layout with five reels and uses a couple of good features as well. There is nothing special about the design, but it doesn’t look like a classic would either. There are decent looking symbols, there is a red velvet curtain in the background, plus the blue reels with golden borders between them. Symbols: Cherries Wild (wild), Free Spins Logo (scatter), Game Logo (500x), Red 7 (350x), Blue 7 (250x), Green 7 (200x), Golden Bell (150x), Bar (100x), Watermelon (75x), Plum (60x) and Orange (50x). The classic icons in use here are not favorites of mine, and I’d say the same thing about the prizes offered and the features which don’t give you too much to work with. You will find Cherries Gone Wild at any online casino which chooses to use software from Microgaming, playable either for free or for real money.